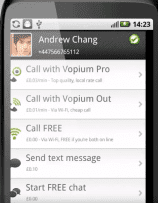 Vopium is a free mobile app available directly on users’ mobile phones. The app works to save users up 94% on International calling by utilizing mobile VoIP technology. In doing this, the mobile app offers a variety of plans with different trappings. These plans include Pay as you go, Vopium to Vopium ($5.14), Call Unlimited ($12.94), Europe Mobile Unlimited ($64.94), SMS World 100 ($5.14), and SMS World 200 ($9.04). In addition to pricing plans, per minute pricing varies on location called. For example, calls to any landlines/mobile device are .03/per minute, SMS is .08/per minute, and Vopium WiFi to WiFi calls are free. Vopium features a full list of rates for other locations on their website. In regards to customer support, the provider features various installation guides and a support center. The support center includes FAQs, use guides, online payment center, downloads, and 24/7 call support. What Do You Think of Vopium?